ProTexting and Best Buzz are Hosting ‘Appy’ Hour Bash, March 9th at SXSW Interactive 2012. Grammy-Award Winning Play-N-Skillz will perform their new single, featuring Pit Bull for the first time ever LIVE! 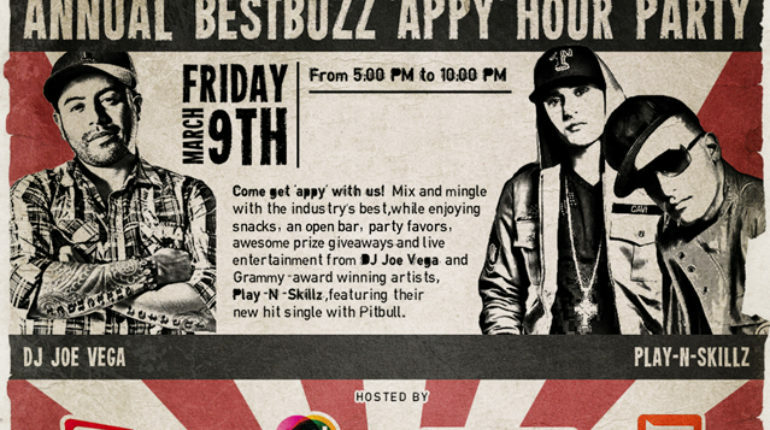 Friday March 9th, from 5pm to 10pm’ish, ProTexting and BestBuzz ), is hosting the ‘APPY’ Hour Party at SXSW Interactive 2012 at the 512 Bar on 6th ‐ 408 6th Street, Austin, TX 78701, where DJ Joe Vega and Grammy‐Award winning Play‐N‐Skillz will perform their new single featuring Pit Bull for the first time ever LIVE! For more information go to ProTexting or for late-breaking news go to Facebook facebook.com/protexting or Twitter @protexting.